Notes: Last year, Oklahoma was 0-4 vs Top 25 competition and lost all four games by an average margin of defeat of 18.2 points per game. Since 2011, Tennessee is 1-26 vs. Top 25 competition with the only victory coming at home in 2013 against #11 South Carolina 23-21. Last year, the Sooners struggled stretching teams vertically averaging 204 passing yards per game. In Saturday’s 41-3 over Akron, Oklahoma passed for 439 yards and completed 66.7% of their passes. Quarterback Baker Mayfield (Texas Tech transfer) threw for 388 yards and 3 touchdowns. A total of 10 receivers caught passes for the Sooners, with running back Joe Mixon leading the team with 3 receptions for 115 yards and one touchdown. This is an important statistic going into Saturday’s game against Tennessee. Last year, the offense revolved solely around wide receiver Sterling Shepard (51 receptions, 970 yards, 5 TD’s). When Shepard went down with a groin injury in the middle of the season Oklahoma’s offensive output dropped dramatically. In Oklahoma’s last five games of 2014, the passing offense was non-existent (vs. Baylor 148, vs. Texas Tech 133, vs. Kansas 39, vs. Oklahoma St. 120 and vs. Clemson 103). In order to get the road victory on Saturday night in Neyland Stadium, the Sooners must produce in the passing game and stretch the Volunteer secondary. This will be the biggest game in Neyland Stadium in the last 5 years. Look for the Volunteer faithful to be “up for this game”- Cumberland Avenue will be rocking for this one! Tennessee is coming off an impressive 59-30 victory over the Bowling Green Falcons. 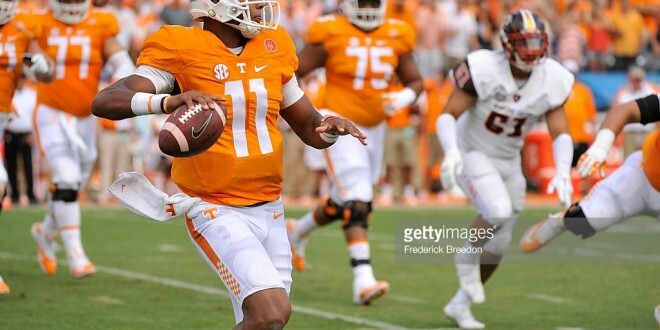 Quarterback Joshua Dobbs led an offensive attack that registered 604 total yards of offense on Saturday and wore down the Falcons as the game progressed. Running back Jalen Hurd had 123 yards rushing with 3 touchdowns and averaged 5.3 yards per carry which help set the tone for Tennessee early in the game. Last year, Tennessee struggled early in the season as the team averaged 94 yards rushing in the first 7 games of last year. However, Dobbs has now led the Vols offense to three straight games of over 170 yards rushing dating back through 2014. In Dobbs’ four of his last six starts dating back to 2014, he has engineered the Vols offense to over 450 total yards of offense. Dobbs is 5-1 as the starter over his last six games as quarterback. Defensively, Tennessee held opposing quarterbacks to under 54% completion percentage in 2014. Against the Falcons this past Saturday, the Vols allowed Bowling Green quarterback Matt Johnson to throw for 424 yards and 2 touchdowns. The secondary allowed 29 of 51 completions by Bowling Green (56.9%) and will need to do a better job at home in Neyland Stadium to strike the upset. In last Saturday’s victory, the Vols allowed Bowling Green to convert on 56% of the Falcons third down attemtps. In order to get the home victory against Oklahoma- the Vols defense will need to step up.